Lombard District 44 is located in the central/eastern part of DuPage County, Illinois. As an elementary school district, we serve students in pre-kindergarten through eighth grade. The majority of our families live in Lombard, Illinois and transition to either Glenbard East or Glenbard South High School after promotion. Lombard District 44 has a long-standing reputation as one of the finest school districts in Illinois. We are home to several Blue Ribbon Schools, exceptionally talented educators, the award-winning John Schroder Early Childhood Center, highly regarded athletic programs and world-class fine arts and music programs. Together, we remain focused on reaching the heads and hearts of every child through challenging curriculum, meaningful connections and necessary resources. We view our students as people, not just pupils, and encourage them to question their world, explore their curiosity and leverage their strengths to overcome struggle. 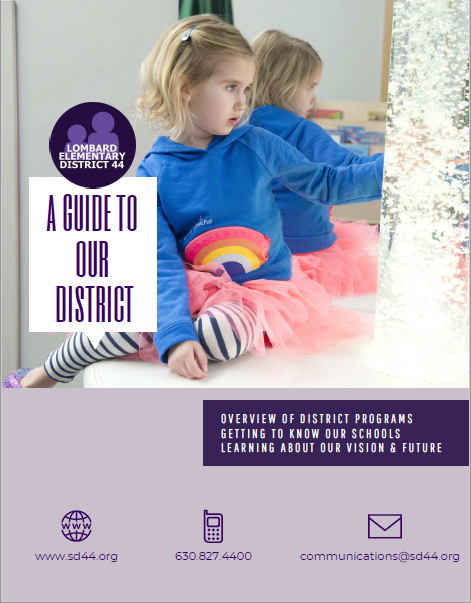 For more information on Lombard District 44, please visit our "Guide To Our District" publication.